I'm so behind on EVERYTHING, especially my blog reading. So why bother even posting today? Well, it IS Bead Table Wednesday. Let me start this BTW with a little information for you. I try to carry a notebook/journal/sketchbook everywhere I go so when an idea hits me I have a place to scratch it down. . . otherwise I'll forget. I've come to the realization that no matter how awesome I think the idea is, if I don't write it down I won't remember it. I've tried to tell myself that there's no way I'd forget certain ideas because they're so great. However, when it comes time to remember that idea; all I can usually remember is that I HAD an idea. As such, it's necessary for me to have the notebook. As such, my craft desk looked like this today. It looks pretty here, but it's not going as well as I'd hoped. The wire continues to spin rather than lay flat on the backs. I tried flattening the wire to stop the spinning, but that didn't work. The overlapping copper foil makes it hard to get the solder to cover the whole back of each pebble. 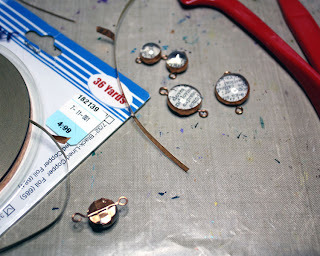 Once soldered, the copper wire looks less impressive because the solder is a pewter-tone. Oh well. . .at least I've got a whole notebook full of other ideas to try. 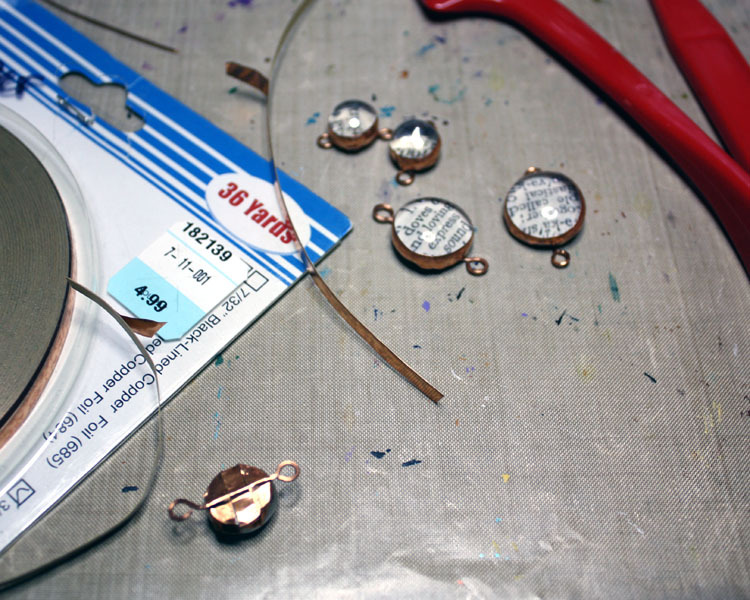 There's more going on over at the Bead Table Wednesday Flickr Group. Speaking of surprises, there's a new bracelet in the shop. I can't wait to discover what's next on my list of ideas. . .
You will get caught up Hope, I have never soldered so I can not lend any advise on that subject, but from what I can see they turned out ok.
Let me just say that I worked on a pair of earrings all day today and right now feel like I accomplished nothing, because they are not how I envisioned they would look and I feel like tossing them on the scrap pile! You are not the only one feeling overwhelmed! It seems to be the theme on many blog posts including mine! my hats off to you for trying the soldering - I've yet to do anything but fuse fine silver! 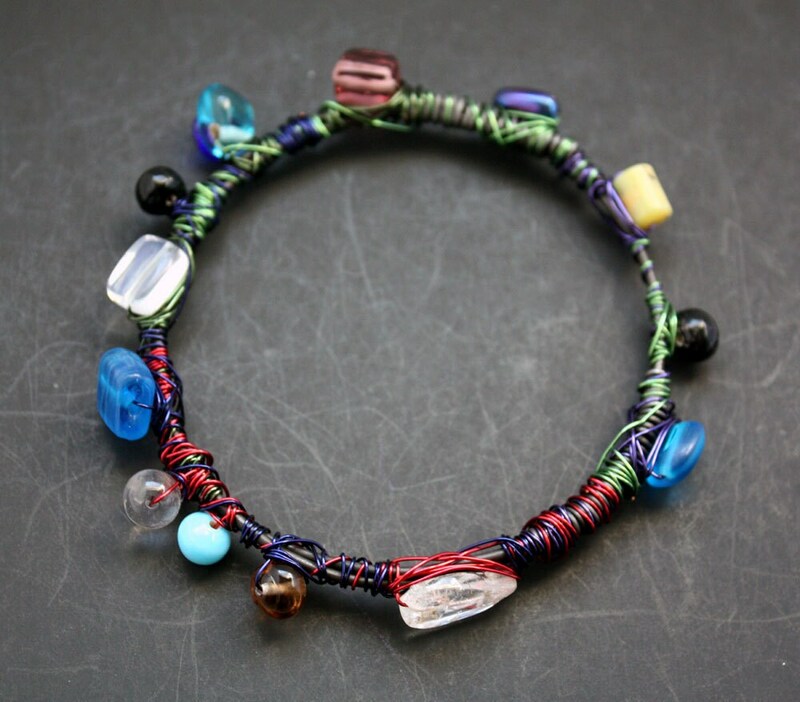 I love the bracelet you made - the wire wrapping is so fun and the textures and colors are way cool!! I love doing that to bangles - it's just fun, isn't it?